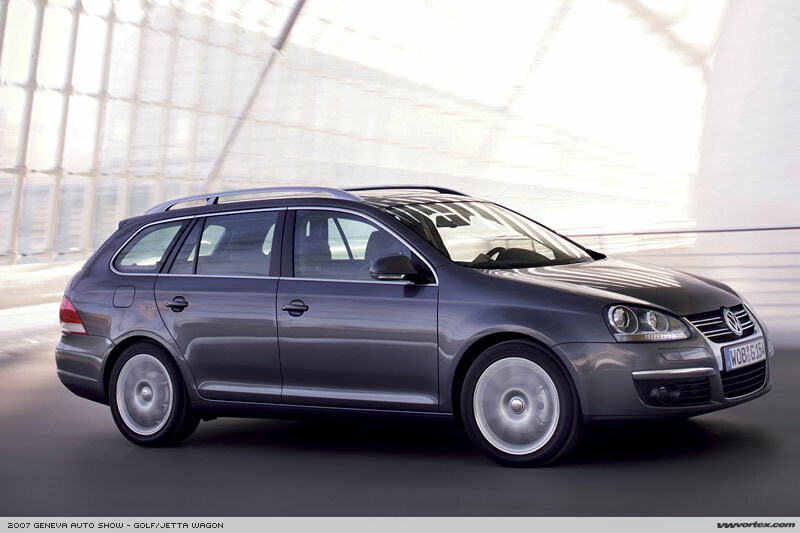 Volkswagen has announced that it will unveil the new Golf Wagon at the Geneva Auto Show. This new wagon will be built on the Golf/Jetta platform in Mexico along side the Jetta sedan and should be available in the European market sometime in June. Here in the U.S., we'll see this exact same vehicle offered as a 2008 Jetta "SportWagen" model that should arrive in dealers around September of this year. The Jetta SportWagen will be available here in the States with a 2.5l base engine (although power may be bumped to 170hp) and a 2.0T with a minimum 200hp. 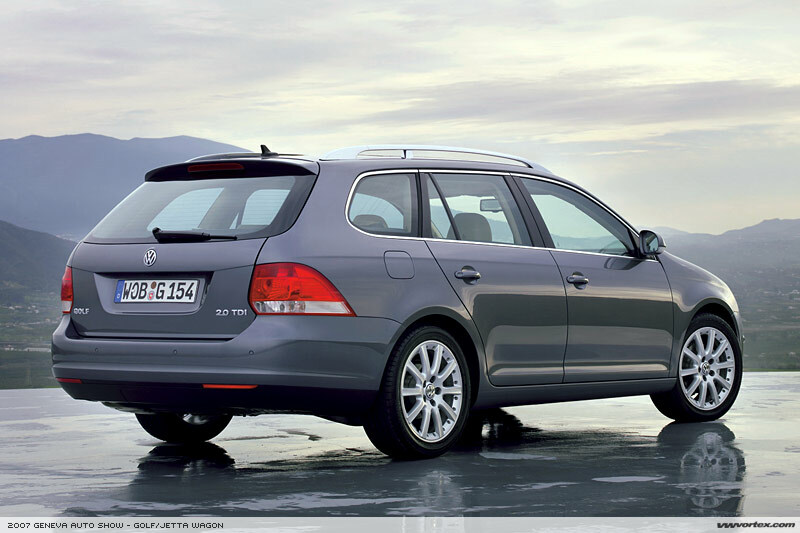 A 2.0 TDI model will also be offered sometime in calendar year 2008. Expect pricing to start at least $1000 more than current Jetta models. The styling of this new wagon appears to be a mix of current Golf/Jetta and Saab-esque design ques with large wraparound rear tailamps that are a departure from anything else VW currently offers. 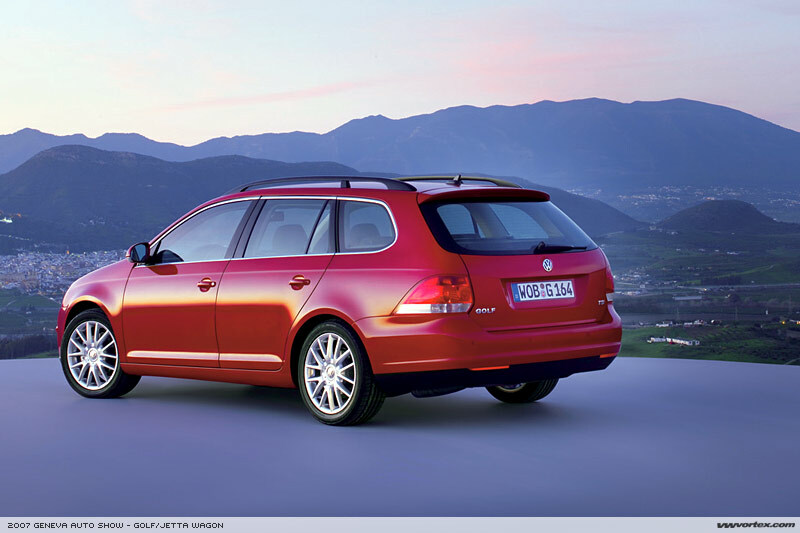 Gone too is the slab-sided look of the Jetta IV wagon in favor or a "sportier" looking rear end treatment. 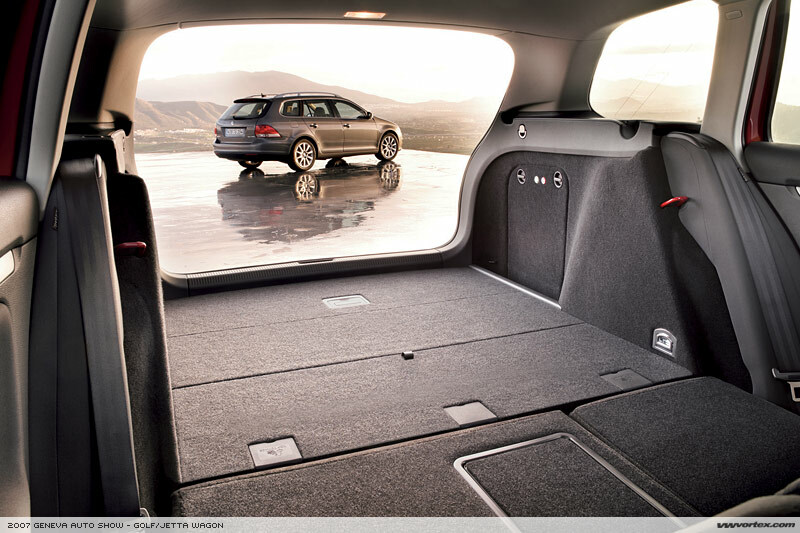 Interior volume with the seats folded down is still considerable at nearly 55 cubic feet and larger than the Volvo V50 (46 cu. ft.), the Jetta Wagon's only real competitor in this segment. The Jetta/Golf Wagon has traditionally been a model that sells fairly well in Germany with more than a million sold thus far. Here in the States the Jetta Wagon is more of a niche model and doesn't traditionally sell in large numbers. We expect the same from this new wagon and VW will likely find the necessary buyers as there are very few alternatives, particularly with a diesel option. For 45 years now, Volkswagens with extra-large cargo areas have been called – unless they are a van – "Variant". To date, more than 6.1 million of them have been sold worldwide. Now there is a new one: The Golf Variant. The third generation of the Golf Variant will be presented in a world premiere at the International Geneva Motor Show (March 8 to 18). Its market introduction is scheduled for this summer, initially in Europe. This wagon, which is as spacious as it is variable, is being supplemented with the addition of a third – and fourth – body version to the successful Golf product lineup. Version 1: The classic Golf, the "icon", including the "GT", "GTI" and "R32". Version 2: The Golf Plus with greater height, higher seat position and longitudinally adjustable rear bench seat. The new CrossGolf, which is based on the Golf Plus, is also being launched currently. Version 3: The Jetta; although it is not called a Golf, in its DNA it is one. For years now, this version has proven to be the most successful car of any German car producer in America. The new version 4: The Golf Variant –not only as a TDI that outputs 77 kW / 105 PS and is economical (5.2 liters diesel per 100 km) and clean (137 g/km CO2). More than 1.2 million Golf Variants have been sold over two model generations since 1993. The new generation of the five-door Volkswagen is meant to continue this success story. Once again, the Golf Variant is characterized by an ideal ratio of interior and exterior dimensions. This is precisely what has always been a key factor in its formula for success: Impressive cargo space dimensions together with reasonable exterior dimensions. The new Golf Variant is not any different in this regard: When the cargo net is installed (standard starting with Comfortline), even with five occupants on board the Golf Variant can carry 690 liters of cargo; up to the load sill at the window level this still amounts to 505 liters (without spare wheel well). When the rear bench seat is folded, the full interior height (0.83 meters) can be utilized, and up to 1,550 liters of cargo can be stowed in the 4.56 meter long Volkswagen. When the rear bench is folded, the continuously flat cargo area of the new Golf Variant measures 1.74 meters up to the driver’s seatback. There are additional storage compartments under the cargo area and in its side trim. Even if the asymmetrical split bench is not lowered, a respectable 1.07 meters of cargo space depth is still available. The maximum width: 1.29 meters. Another dimension that is crucial when it comes to cargo capacity: Payload capacity. And here too the new Golf Variant has a whole lot to offer with 607 to 629 kilograms capacity (depending on engine version). And it is easier to load cargo with a liftover height of just 57 centimeters. A synthesis of new and classic style elements marks the design of the third Golf Variant. In its silhouette, the lines of the new Volkswagen definitely forge links to the Passat Variant. Nevertheless, from this side perspective the Golf Variant also exhibits a high level of autonomy. One unmistakable characteristic: The taillights that wrap around far into the car’s flank. The rear end of the new Variant shows an entirely new side of the Golf. While about half of each taillight is integral to the rear hatch on other body versions of the model series, on the Golf Variant they are integrated completely in the fender. Visually, the taillights emphasize the large load width of the hatch opening. And it is actually over one meter wide. Simultaneously, the rear design of the Golf Variant attains a very independent character due to the newly designed taillights. Typical Volkswagen design characteristics, analogous to those of the Passat Variant, are the rear window that wraps around to the D pillars (also an indicator of large load width) and the roof edge spoiler that acts as a trailing edge to optimize aerodynamics (increased tread pressure, better fuel economy). Air resistance coefficient: cW = 0.31. In parallel, spoiler accentuates the decidedly sporty image of the new Golf Variant. The front end design is distinguished by the chrome-plated insignia radiator grille. This is also reflected in the chrome bumper protector strips. Taken 1:1 from the general model series were its headlamps (optional bi-xenon for low and high beam lamps), fenders and engine hood. 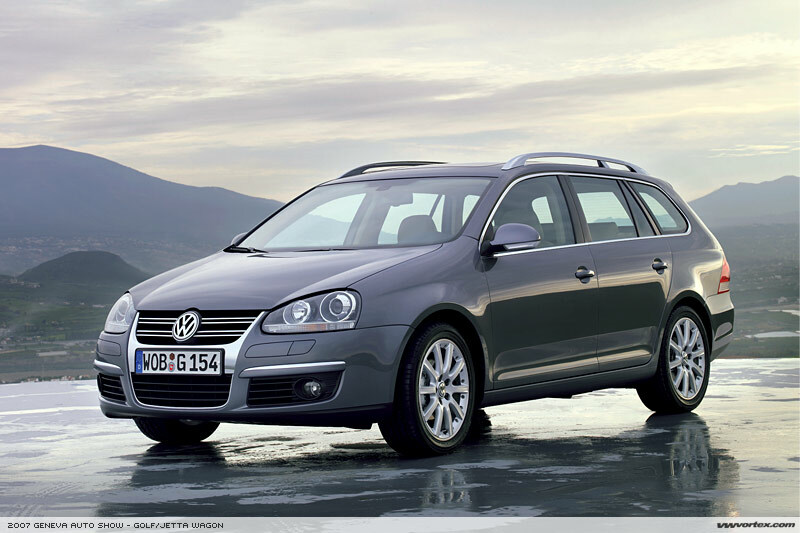 At its market introduction Volkswagen will be offering the Golf Variant with two gasoline and two diesel engine options. The gasoline engine outputs 75 kW / 102 PS. The two diesels of the Golf Variant deliver even more power with extraordinary economy: 77 kW / 105 PS and 103 kW / 140 PS, and they are among the most efficient engines ever. The smaller of these two TDIs is content with just 5.2 liters fuel per 100 kilometers. CO2 emissions: Just 137 g/km. Moreover, the large TDI of the new Golf Variant is as fuel efficient as it is environmentally friendly. In spite of its hefty maximum torque of 320 Nm, the Golf Variant 2.0 TDI, which can attain speeds up to 205 km/h, consumes just 5.6 liters fuel per 100 kilometers. Its CO2 value is 148 g/km. Like the Golf, Golf Plus and Jetta, the Golf Variant will also be available with different six-speed automatic transmissions, including the DSG dual-clutch transmission. Like the "classic" Golf, the new Golf Variant will also have the "Trendline", "Comfortline" and "Sportline" equipment lines. Even the "Trendline" base model exhibits extensive convenience and safety features including six airbags and ESP. All versions get bumpers and accent protector strips in car color, as well as a chrome insignia radiator grille and roof rails. Buyers of the Golf Variant Comfortline also get 16-inch alloy wheels ("Misano" type) with 205 tires, "Climatic" semi-automatic climate control system, "comfort seats" in front (including adjustable lumbar support and center armrest), a rear seating system with center armrest and cargo pass-through feature, automatic dimming rearview mirror, and sensors for rain and driving lights. The Golf Variant Sportline comes with standard features such as a sports chassis lowered by 15 millimeters, sports seats in front, 16-inch alloy wheels ("Atlanta" type) with 205/55 tires, on-board computer, leather sports steering wheel and identical climate control system. Volkswagen Individual is also planning a special exclusive version of the new Golf Variant. 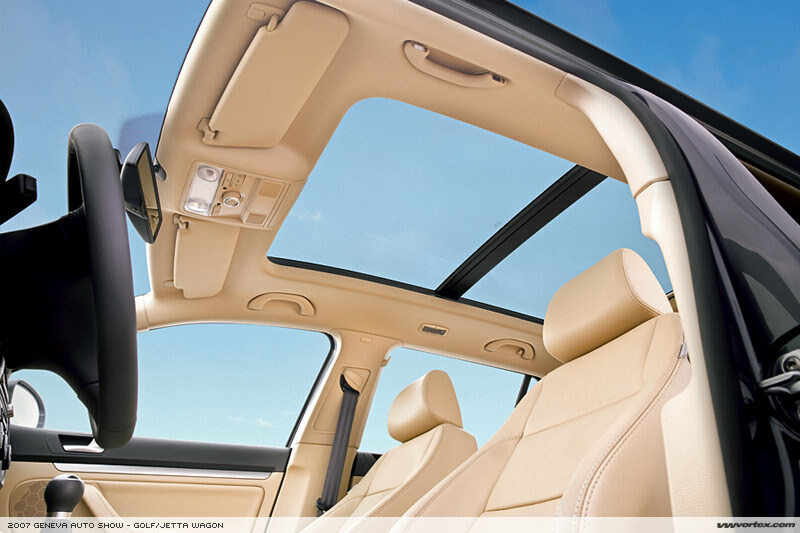 As a feature of all versions of the Golf Variant, there will be a newly designed panorama sunroof. With a length of 1.36 meters and a width of 0.87 meters the transparent sunroof spans a large section of the interior, providing for a light-filled, friendly ambiance. The roof consists of two halves, the front section of which can be raised as well as completely opened. To preserve full interior height, the opening segment is driven out above the closed section of roof. An electrically-powered sunshade can be used to protect against intense sunlight. For more discussion on this story, click on the link to our discussion forums to the left. For more photos related to this story, click on the link to our gallery at the right.